In these days of ever increasing prices and dwindling supplies of gas, it is more important than ever that we get the maximum amount of useful heat from the gas we burn. There are two ways we can achieve this. It is important to keep the heat we generate within the building by using insulation and energy conservation measures. Modern houses are built to high insulation standards, but if your property is more than ten years old, your insulation could probably be improved. The most cost effective energy conservation measure is loft insulation. You should have at least 200mm (8") and preferably 250mm (10") of fibreglass insulation in your loft. Other measures you can employ are cavity wall insulation and up to date double glazing. You may be entitled to a government grant to improve your insulation if it is deficient. Contact your local authority for further information. Whilst virtually all new boilers fitted in UK homes are 'high efficiency' condensing models many are not fitted with the correct control systems to enable them to work at optimum efficiency. Condensing boilers are at their most efficient when they are in condensing mode, this means that the latent heat from the flue gasses which would normally be wasted is recovered and returned to the system. A condensing boiler will only condense when the system return (water coming back from the radiators to the boiler) temperature is low enough. Traditional UK central heating systems were designed to heat a house when the external temperature is -30C with a flow/return temperature of 800C/690C . If we apply these same design criteria to a condensing boiler the boiler will never condense. Systems also used on/off thermostats which are not very accurate and cannot control the boiler output, the boiler will run flat out or off. 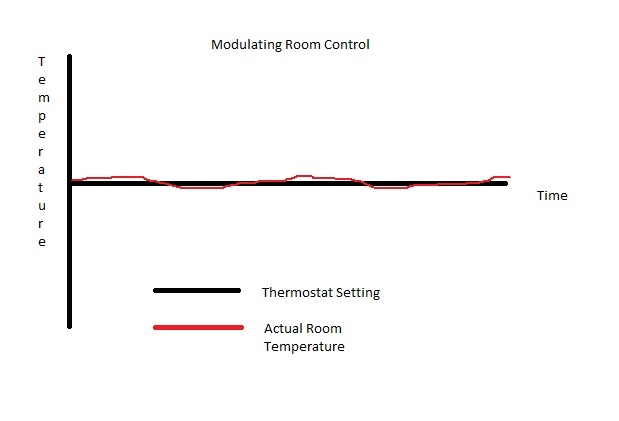 This leads to a variation in the room temperature as shown in the following graph, and inefficient use of gas. Even in a cold winter, there are only a few days when the external temperature in the UK is as low as -30C meaning we can effectively heat the house with much lower flow and return temperatures, enabling the boiler to condense and therby using less gas. How do we achieve this? By using 'intelligent' Opentherm controls, coupled with an outside temperature sensor, the boiler output can be matched to the required heat load. 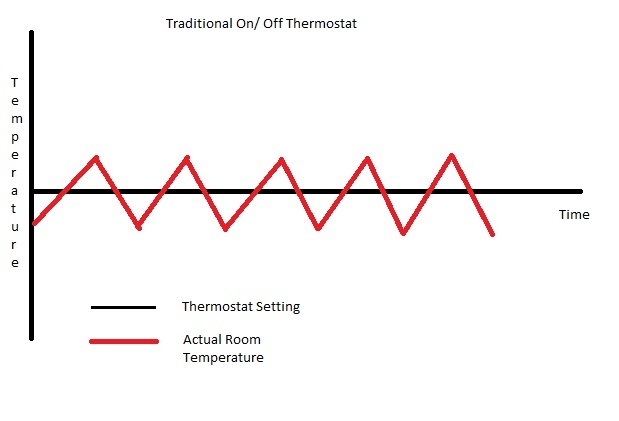 Opentherm is a protocol allowing two way communication between the boiler and the controller, between them they can work out the most efficient way of running the boiler, allowing it to condense in the way it was designed , saving energy, increasing comfort and prolonging the life of the boiler.